Cherry here, cherry there, cherries errrrrywhere! Tis’ the season here in Tennessee. Every single market around town is packed full of rosy, bold, bubbly picks that are just screaming to be transformed into something delicious. I can’t walk by a table without grabbing a bunch. It’s almost like they are just whispering my name like some sort of enchanted Disney bluebird would. Naturally, the first thing we have to do with these is cover them in some booze and have a nice cheers to summer. For that, this Vanilla Bourbon Sipper does quite the job. 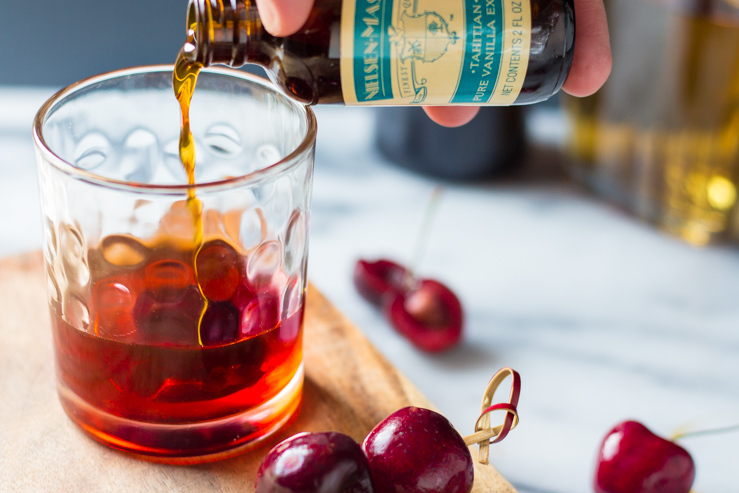 Good ol’ Southern bourbon, rich Nielsen-Massey Tahitian Pure Vanilla Extract, a splash of sweetened vermouth, and a plump dark cherry dunked in a glorious simple syrup. This libation isn’t one of those pound it by the pool party kinda pours. It’s more of the sit on the back patio and chill after making burgers on the grill from a long day in the sun have a sip at a time sorta cocktail. A summer sipper, if you will. There isn’t a lot of fluff going on inside this glass. It’s pretty stout and deserves to be patiently enjoyed. By deserves, I mean that you would end up on the floor if you drank it like you did that LIT earlier. Simmer down. Take a moment. Swirl it around a bit and act like one of those people that can magically pick out that a hint of California evergreen bark dust back notes that exist in that wine they just tasted. You deserve it, right? As I get a bit… *cough* older, I’ve slowed down. Less running around town and more going to bed at 10 (read: 9). I have to be honest– I don’t really hate it. At all. Spending a relaxed summer evening on the back patio that is overrun by the insane amount of tomato plants and herbs that I attempted to grow, enjoying a little snack or three (Umm… Hello, Blackberry Bourbon Cupcakes. ), listening to a bit of music while reliving the Celiene Dion hits that your mom used to play in the minivan (that you possibly remember every single word to), sipping on a nice nightcap just isn’t awful. It’s actually pretty nice. If you’re going to really enjoy a sit-down with friends, this cocktail is going to be your best friend. 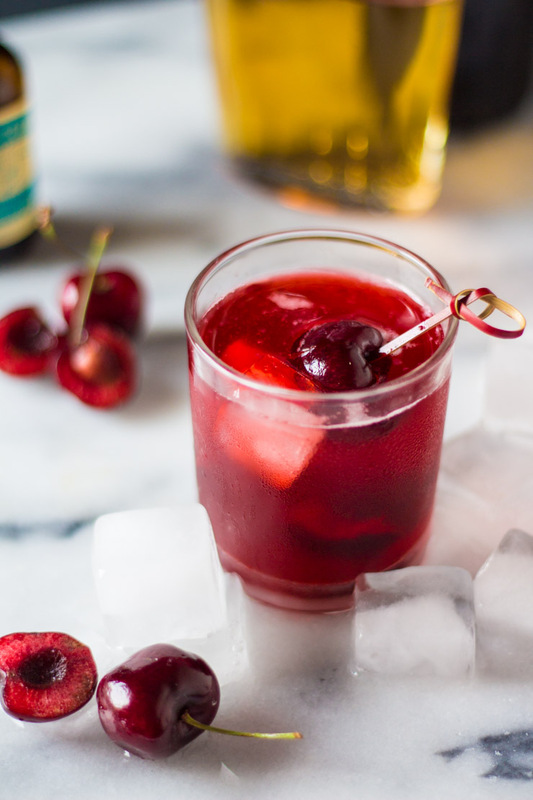 Fresh cherries (go all out–skip the sugary, jar-bound maraschino ones for this) and a rich, deeply-flavored vanilla are the perfect companion to that good ol’ Southern charmer– bourbon. Let’s chat about the mixers in this beauty. — I think that a lot of people reserve vanilla for baking. You don’t have to buy some pre-infused boozy bottles to get that hallmark flavor into your other creations. A quality, cold-extracted vanilla extract is absolutely perfect to blend into your next glass. I used Nielsen-Massey Tahitian Pure Vanilla Extract for this cocktail. If you are going to use vanilla, and I can’t say this enough, use a really, really great quality vanilla. There isn’t anything worse than a poor flavoring addition. You wouldn’t ever add a fake bourbon to a drink, right? Stick with the good stuff. You’ll definitely notice the difference. I’m partial to Nielsen-Massey vanilla products. This is a company that has been making high-quality products since 1907. That’s like… older than dirt itself. Scientifically speaking, of course. Vanilla products produced by Nielsen-Massey are used by household cooks and professional pastry chefs alike, and they are still going strong for a great reason. N-M uses a cold extraction process to prevent the breakdown of all of the delicious flavors trapped inside those perky pods. And it works. You’ll taste a world of difference in utilizing a quality product like these in your creations. I opted to use the Nielsen-Massey Tahitian Pure Vanilla Extract because of it’s well-balanced, slightly-floral, cherry-like flavor profile. See a trend here? 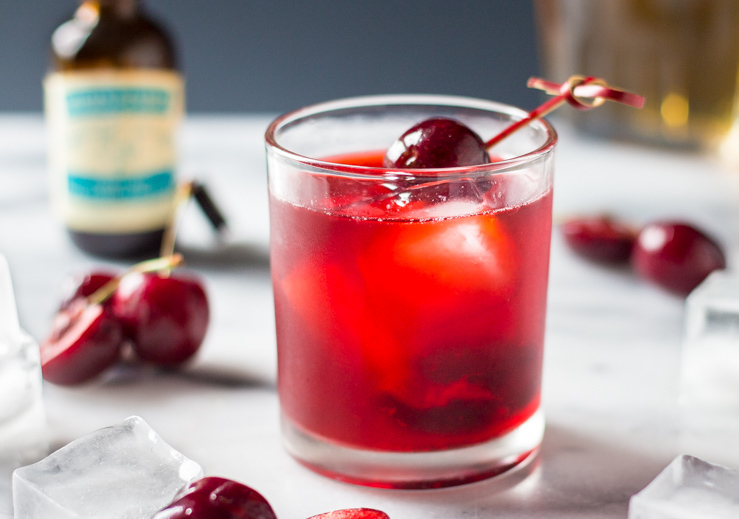 The hint of cherry reminisces perfectly with the fresh dark cherry that we start the drink off with. Making those flavor connections is the key to forming a perfect cocktail. 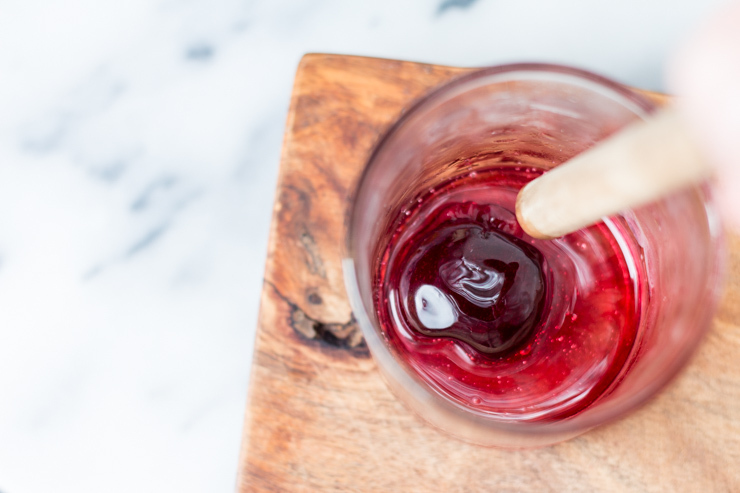 Along with the vanilla, a splash of simple syrup (I used gomme syrup here because it’s quite smooth – visit our Amaretto Southern post for more about that) helps to ease the tartness of the dark cherry. A quick swizzle, and you’ve got yourself an immaculately perfect summer sipper. Aged Kentucky bourbon (Hey Y’all! ), that rich vanilla, a bit of sweetness from the vermouth and syrup. 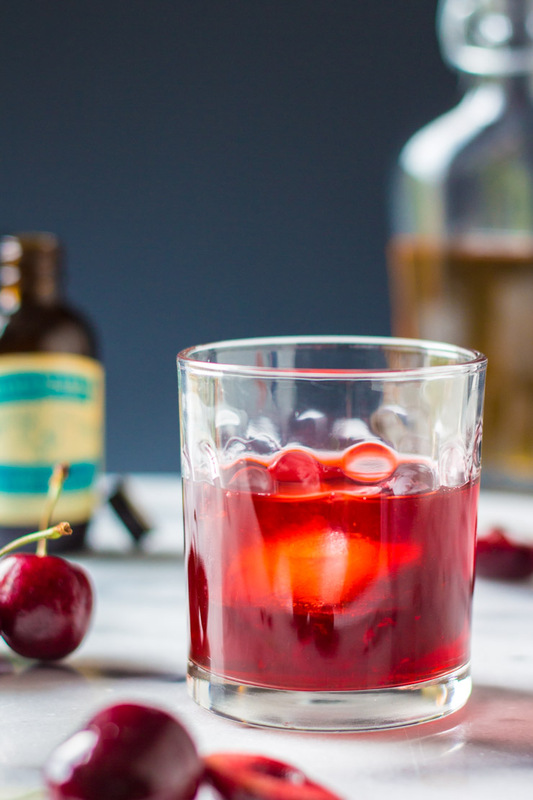 Similar to a Manhattan, but with a bit different ratio and cherry type along with the addition of simple and vanilla. It’s just a well-balanced, stout drink to enjoy. Each time you take a sip, you’ll start to recognize the different elements in the mix. I prefer to ice mine and give it jujutsu a minute or two to breath. It opens all of those oils and flavors up and is. just. perfect. Cheers to nearing the end of summer and starting towards fall. Best enjoyed with good company, this sip is sure to make the season just that much better. Follow Nielsen-Massey on Facebook for some deliciously vanilla recipe (including some of ours) ideas! A summer sipping cocktail perfectly designed for evenings on the patio with friends to end an eventful day. -- Bourbon, vermouth, sweetened dark cherry all tied together with a warm, caramelized vanilla element. By SouthernFATTY.com food blog. In cocktail glass, add dash of bites. Swirl to coat inside of glass as best possible. Add pitted cherry and cover with simple syrup. 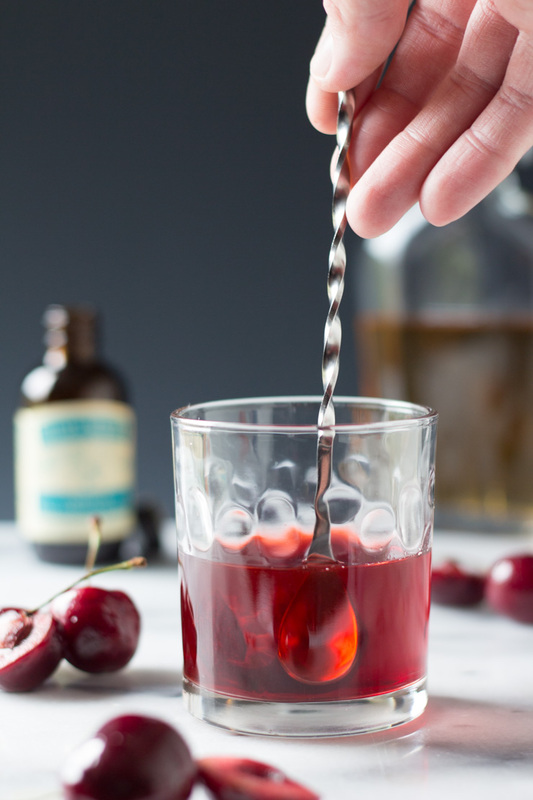 Muddle cherry into syrup to release cherry juices. Add remaining bourbon & vermouth. Mix in the Nielsen-Massey Tahitian Pure Vanilla Extract. Swizzle stir well to combine. Add ice and enjoy this summer sipper by Southern FATTY. NOTE: This is a strong, sipping cocktail. 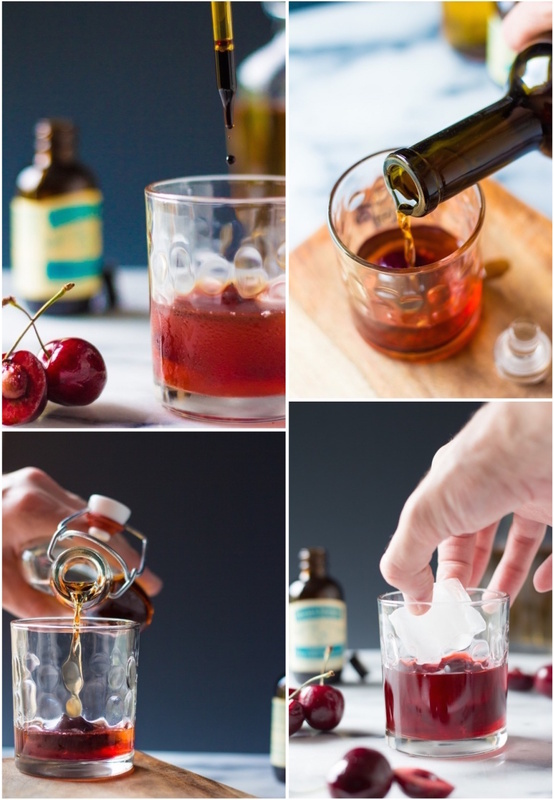 Try it before and after you allow the ice to slowly melt into the bourbon-base for varying flavors. DISCLOSURE: This post is sponsored by Nielsen-Massey Vanillas. Compensation and/or products may have been provided. The views and opinions posted here are that of my own with no influence by the sponsorship. I have accepted this sponsorship because I truly value and use this companies products and have a positive experience that I wish to share with my readers. Found you searching for peach syrup recipes, now 4 posts in I’m a subscriber! Your humor is infectious & I can’t wait to start mixing cocktails! Thank you for making my day!! Say hello on our Instagram or something if you end up making anything from the blog! Making this tonight! Have everything already. This whole post made me miss my North Carolina hometown — then I looked up the heat index for NC today and got over it. I’m sure this drink will be JUST as awesome in Southern California. Bahahahhaha — I couldn’t possibly love this comment any more!